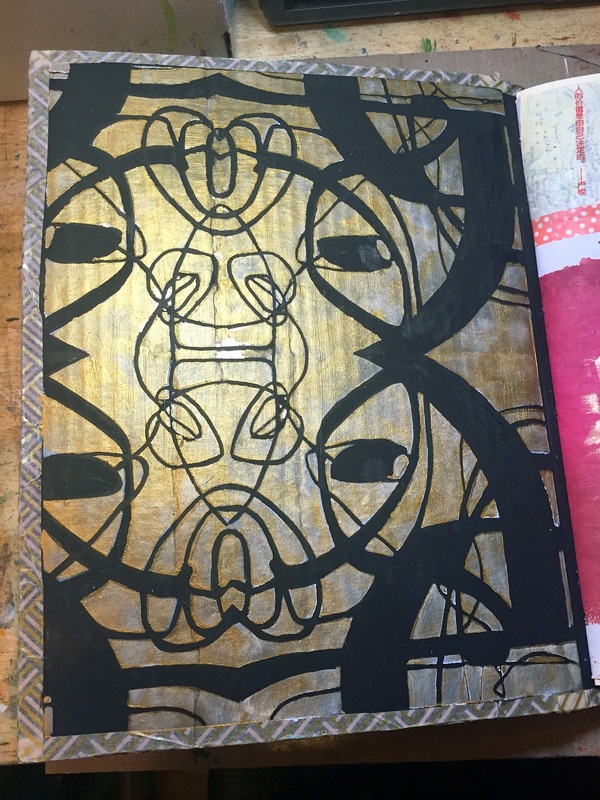 StencilGirl Talk: May StencilClub: Gettin' Blingy With It! 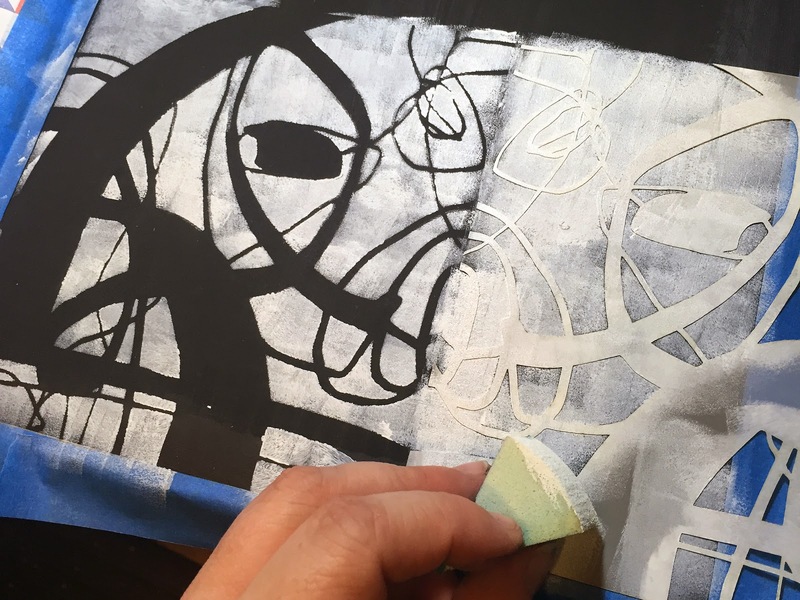 May StencilClub: Gettin' Blingy With It! Hi everyone, it's Gwen back again today to share a project using this month's awesome, exclusive, StencilClub stencils designed by Mary Beth Shaw. The journal itself is about 9x12, and the spine is about 2 1/2" thick. It's actually made from a cardboard box. I got a package in the mail, and when I saw the box it came in, I immediately thought book! I just cut off all of the sides except one, which became the spine of the book. Works great! 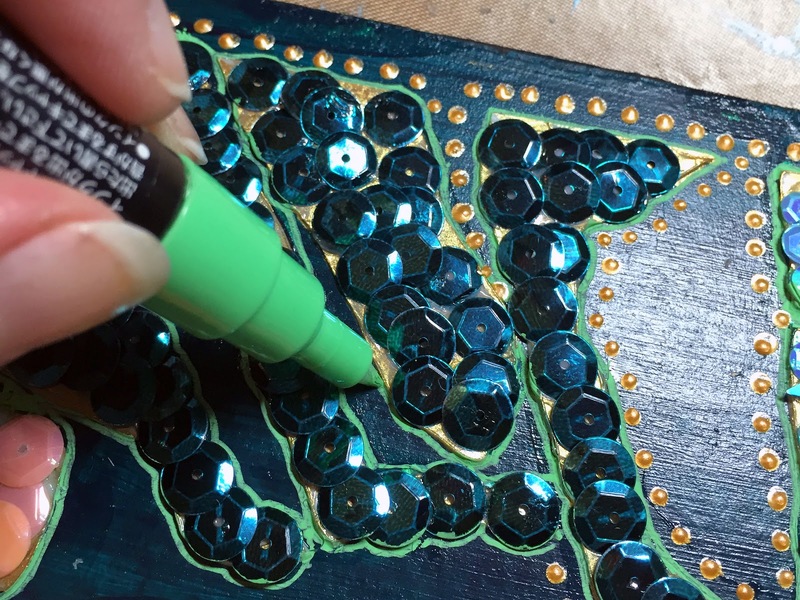 Of course, you could use the same technique on a canvas board, the top of a jewelry box, around a wooden frame... anything you can think of that you might want to decorate! 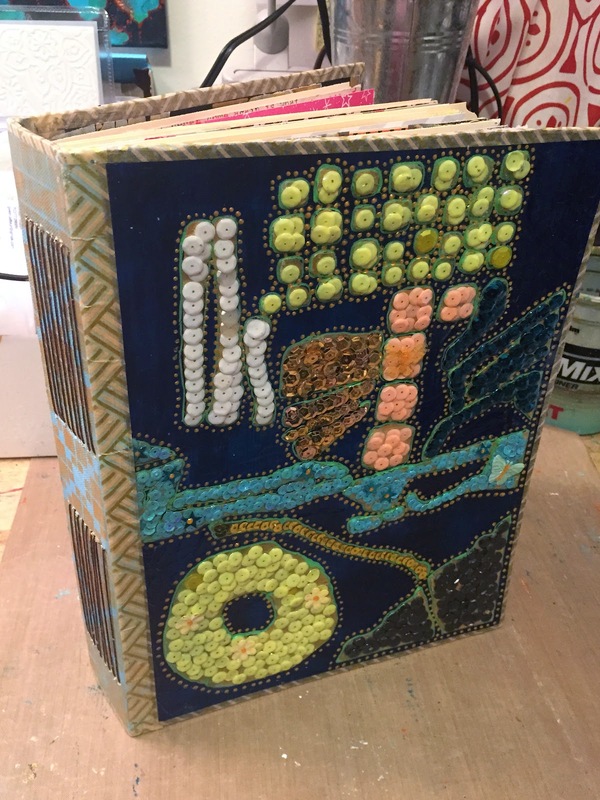 To start, painted the entire cover with Pthalo Blue (Green Shade) - I was thinking of a jewel box look and I thought that might make it look like a velvety background. 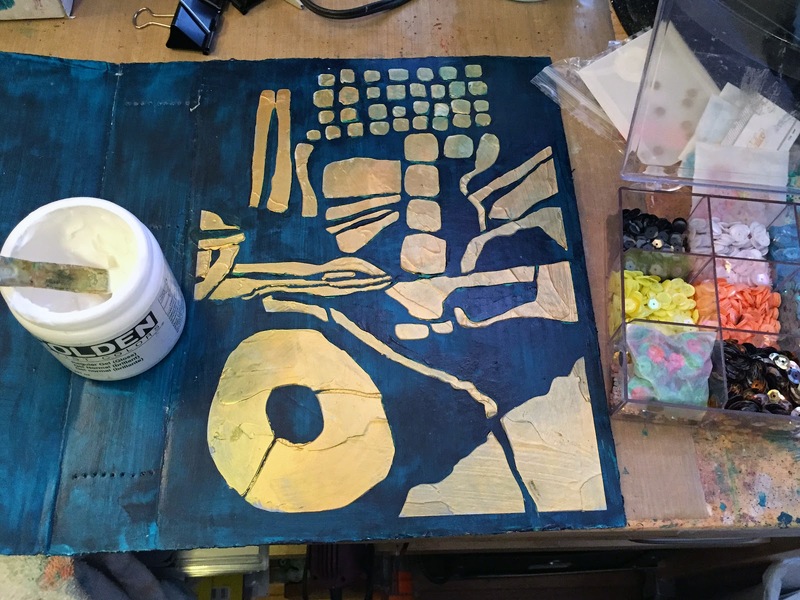 I used a palette knife to spread gold embossing paste through the 9x12 stencil on the cover and let that dry. 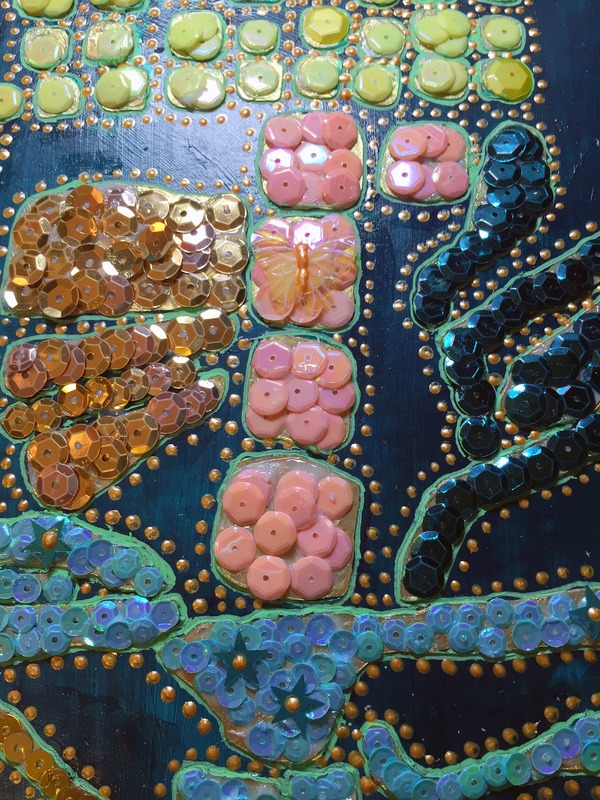 Next, I used gel medium and started covering small sections of the shapes and then filling them in with sequins. I didn't actually take as long as you might think... it definitely wasn't the fastest project I've ever done, but I did the whole cover in less than two hours. 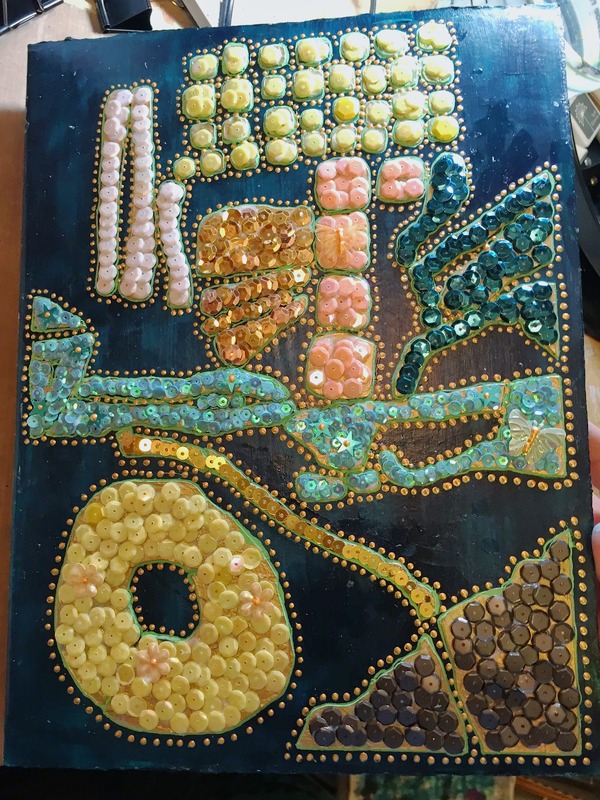 Keeping with the jewelbox theme, I did different colors of sequins in different sections... I had some small sequins for some of the smaller areas. Once they were all down and dried, I used my Posca paint pens to outline the sequined areas and add a bit of definition. Naturally, Liquid Pearls were involved. I need my dots! Here are a few close-ups so you can get a better look at some of the finished areas. Next I moved on to the spine. 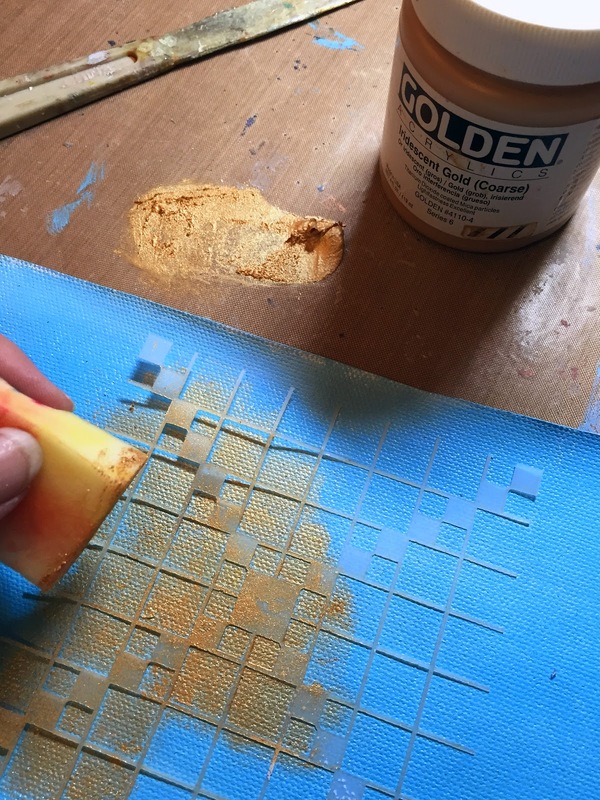 I took a piece of painted canvas and used the 4x4 stencil with gold paint - it was the perfect size for the spine of the book! 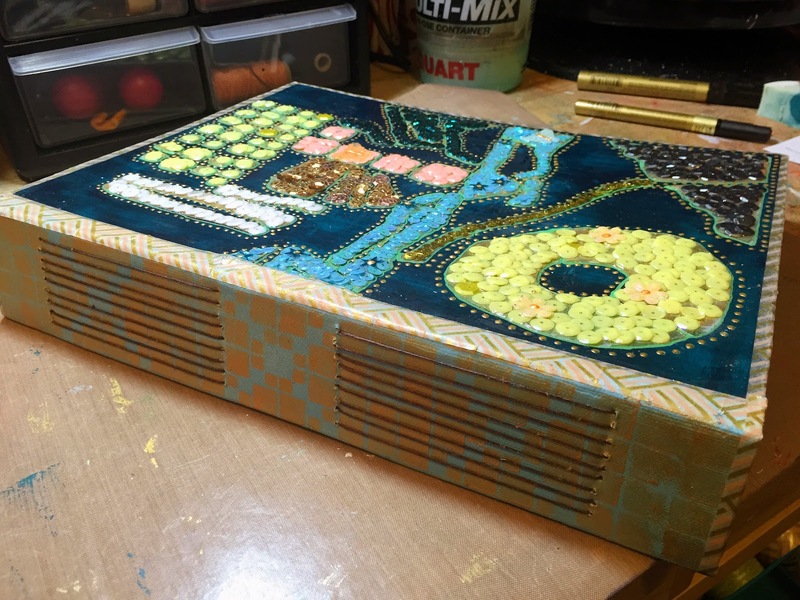 Once that was finished and dried, I glued the canvas to the book and sealed it. After binding the text block into the book, I finished up with the inside covers. For this I took the 6x6 stencil and made a repeating pattern. Since the base coat was done in black, I went over it with white first so I wouldn't need as many coats of the color. You can see below how you can flip the stencil over and line it up to get the repeating pattern. I finished it up with a light coat of gold paint and then did some cleanup (a LOT of cleanup!) with my black and gold paint pens. Below you can see what it looked like repeated across the entire page... super cool, right? Love this design! There you go... a finished book decorated using the May StencilClub stencils. I had so much fun working with them for this month's project, and I hope you're feeling inspired and excited to get this month's stencils! If you're not a member of StencilClub yet, sign up by May 15th and you'll start your subscription with this month's stencils! What an awesome tutorial! I love your blinged out book. 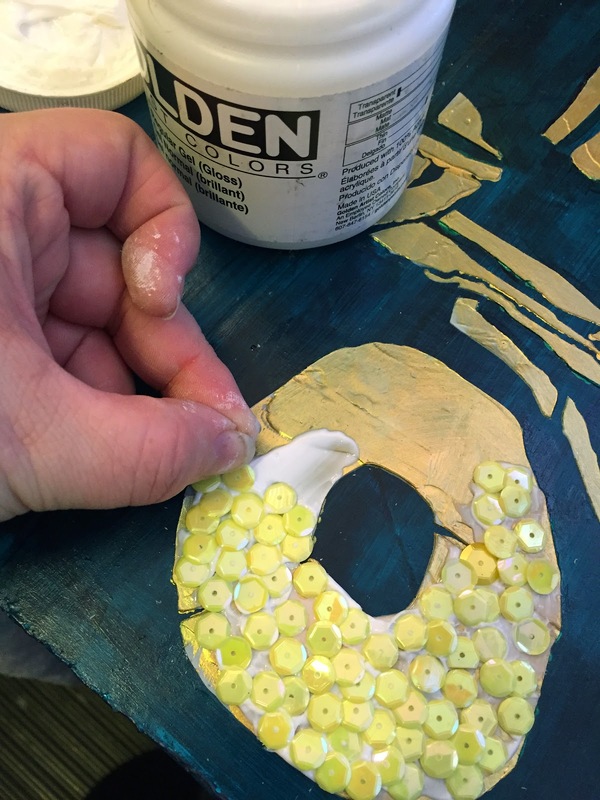 I'm filing away your suggestion to lay a heavy coat of gloss medium to any clothes all those gorgeous sequins. Love it! Thanks Jessica! I've done that heavy top coat a few times... it works great! I've used self-leveling gel and tar gel too. I don't think they're meant to be used as a final top coat, but for this kind of thing I think they're good enough. I love books, this is great. The sequins are a really good touch. Can't wait to get my new stencils! 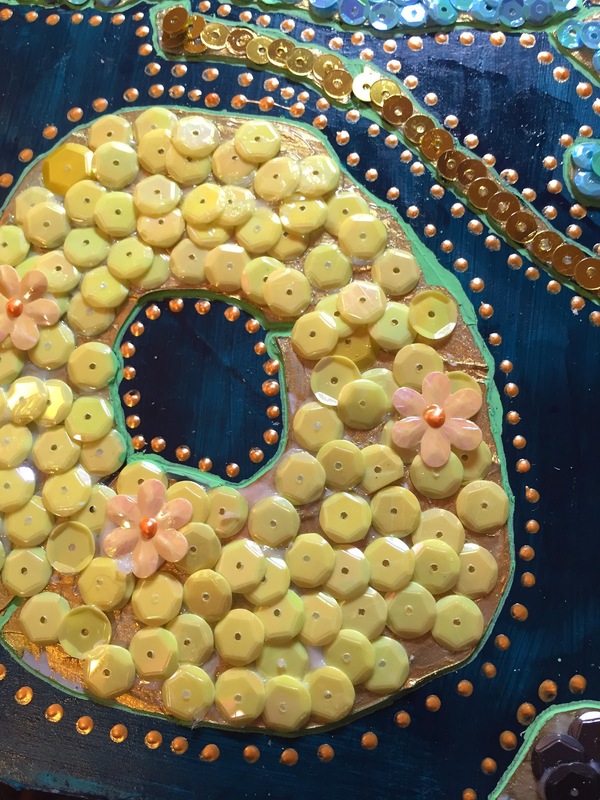 This is definitely the most creative and coolest use of sequins that I have ever seen! Stunning cover! !